I haven’t been out at all today & suddenly remembered tonight I had no photo for today. 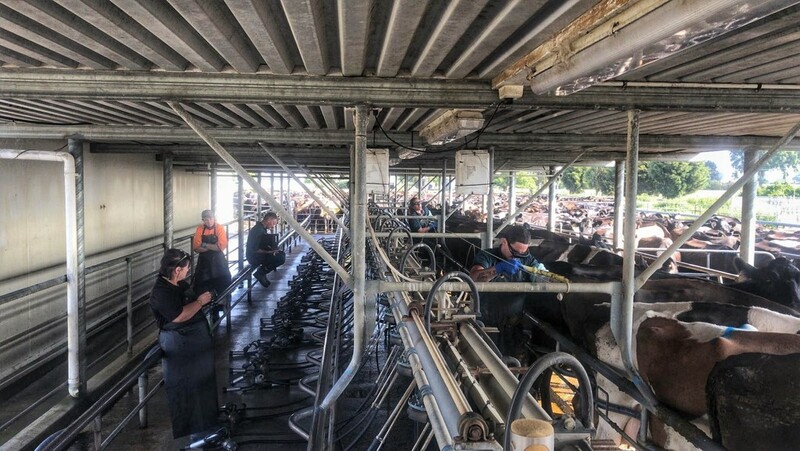 Suddenly remembered my eldest son in NZ had sent a photo the other day of vets scanning their cows to see if they are in calf. Quite an interesting photo...to us anyway so thought I would pinch it! I haven’t heard the result! They are in Auckland at the moment having been to see Sarah Millican in concert. 1. I bought a wheat bag off a friend this morning, she makes them for charity. 2. So lovely to lock the doors after our tea & sit beside the wood burner...best part of the day when it’s so cold! 3. Our son in law is having a great time skiiing with friends although rather too much snow for his liking! A fascinating view behind the scenes at the farm. This is a huge area and full of equipment! Serious farming! I presume your B&B guests have a key too? My goodness! Farming is very technical now! Great photo. @maggiemae No one in for next three nights zmaghie but when they stay they do have a key, we never see then come in as they go in the front & bypass our quarters! @louannwarren It is indeed, lots of tech stuff! @busylady b big stuff here as they need to know which cows are in calf, the answer depends on their future for the next few months. Lets hope they had a good result .. a job we have yet to do .. It all hinges on these results... Usually a job for me to do the recording ..
That's very interesting. Hubby has just been re-reading James Herriot's books, so this is quite topical in our house! Just like a factory !! with all those clients outside waiting for their turn . So much precision in farming these days . @julzmaioro I helped with the recording once when Ant & Jo were milking, like an ice cream seller with my little tray! We didn’t do it quite like that here. @beryl There is Beryl, lots of systems to help farmers but lots of new rules & paperwork to fill in too! @casablanca Ah James Herriot a calmer nicer way of farming in my opinion! Loved those books & the TV series. @gijsje I thought so too! Wow... that's quite the system! gReat shot. Interesting shot, it tells a story. So neat to see how others do it. It does have an air of efficiency about it! Nice shot, how farming has become so scientific!